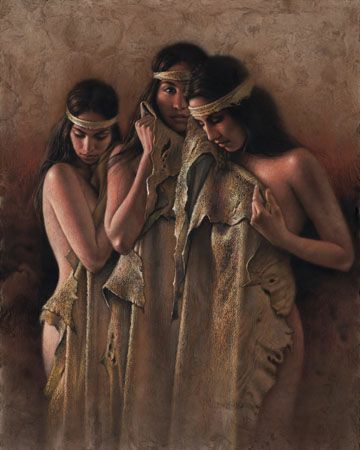 Lee Bogle Hand Signed and Numbered Limited Edition Canvas Giclee:"The Bathers"
Edition : Artist Signed and Numbered to 250 with 50 Artist Proofs (AP's) Personally Enhanced by Lee Bogle. Image size (inches): 24" x 30" and 40" x 32"
About the Artist : Lee Bogle can't remember when he wasn't an artist. Drawing, painting and picturing life are among his earliest memories and have always been more than a pastime. He describes his art as an enduring passion. Lee's technical skills as a draftsman are especially evident in his renderings of the human form. Collectors know his images of Native Americans, often solitary figures of women whose beauty far surpasses the superficial. He combines vivid, realistic detail with the expressive qualities of abstraction. His paintings reflect his appreciation for the organic, and he is a master at depicting the expressive quality of light. Lee received his art degree from Central Washington University and pursued graduate study at the University of Washington. His work is exhibited widely in galleries and museums across the country. No thank you, I just want the 30x24 SN Canvas.